Went to Nehru Place today to get Surabhi’s laptop fixed. The fan on the laptop wasn’t working so the system wasn’t booting up. Its an IBM Lenova. All I can say for that is my Sony Vaio was on for 24 hours a day for almost 2 years and only then the fan started making noise so I decided to get it changed, while this laptop is little over a year old and the fan already died… Same thing with my HP Compaq laptop. That one was on 24 hours a day for about 2 year + with no issues so far. Anyways, so I drove to Nehru Place in the boiling heat, on the way there I got stuck in traffic and spent about 1 1/2 hour for a drive that is a max of 1/2 hour usually. Once I got there I saw a IBM showroom almost immediately so I asked them if they would fix this system and they gave me the address of their service center that was over on the other side of the complex. So I walked all the way over to the other side climbed 3 stories of stairs and found the following sign on the service center’s door “Due to the powercut the service center is closed for the day”. *Gah! * One would assume that IBM would have enough money to put a backup power-supply for their service center. So I called the IBM guys again and they directed me to another center. That was also closed for the same reason. Then I decided to take the laptop to a shop I knew did good work and get it fixed. It took them a little more than a hour and a half to get the laptop fixed and I was good to go. During all of this I also bought a 500GB portable HDD as a gift and a battery charger for me (I got sick of buying new batteries for my wireless mouse) Finally got home and just about crashed. Right now I am sitting in a AC room and not planning on leaving it for a while. 🙂 Although tomorrow I might have to go and get my chair fixed. One of the legs broke (Its one of the revolving chairs with 5 feet at equdistance in a circle) and I have to balance on the remaining four legs when I want to work on the computer. Its sitting in the car right now but lets see if I have the courage to go out again tomorrow in the heat. Watched the pilot episode of Virtuality today. Its a new show where Earth’s first starship is on a ten-year journey to explore the Epsilon Eridani star system. To keep the crew sane VR (Virtual Reality) modules are installed on the ship and the crew uses them to decompress. The pilot was decent, I mean it wasn’t awesome great but watchable. If it was going to be produced as a full show I would probably watch it. It has a lot of room for interesting developments. Plus I liked the ending of the pilot. Basically the main idea behind it is that there is something wrong with the modules and it looks like someone hacked the system, but since the spaceship is beyond pluto, only someone on the ship could reprogram the modules. At times it took a few seconds to figure out if a scene was a VR scenario or the actual show. Another thing that got irritating was the frequent views of the ship from the outside from one of the exterior camera’s. They were interesting at first when they followed the captain through the ship but later they added no content/anything to the story and just took screen time for no reason. The show is a pretty cool take on how future astronauts could spend long periods of time in space without going nuts. Catch the pilot if you are interested in these kinds of shows. You just might like it. Today I decided to replace the stabilizer being used in my room with another model that supported AC’s upto 2 tons (The current one supports upto 1.5 tons) This was because we are having a 1 ton AC put in and it makes more sense to put the 1.5 ton stabilizer over there instead of the 2 ton. So I spend 15 mins to disconnect the old stabilizer and then left it as is to go out. Once I got back I started to connect the new one in… Now the thing is that the AC plug is behind my desk and the desk is really hard to move. Its one of those L shaped desks and its fitted really tight over there so first I had to pull the desk out before I could get to the plug. Then I had to remove the plug from the input cable so that the wire could get through the little hole in the desk to where the stabilizer is supposed to sit. This was the easy part. The hard part was to put the plug back on the wire when there was a distance of about 6 inches between the wall and the desk to work in… Finally got everything connected and when I switched the thing on it didn’t work… The power came on but no output. Seems like the cutoff was kicking in. Atleast my AC is working and my computer is connected to the web. I have been using the latest version of Firefox(FF) 3.5 for the past few days and I am pretty happy with it so far. I first started using FF when it was version 0.5 (or was it 0.6). Since then I have used every alpha and beta version that Mozilla released for any of its new versions. This is the first release for which I never tried out the alpha/beta versions. The first time I downloaded it was the pre-RC version Beta 99 that was released just before RC1. Some of the things have changes. One major change that I have noticed is that it is using a lot less memory than any of the previous versions. Previously it would routinely take up 200-300 MB of RAM, currently it is using 100MB after about a day of surfing. The privacy mode is also nice but I haven’t really tried it out yet. I haven’t really noticed a lot of speed difference while surfing yet but it does start up faster. I am eagerly waiting for the final version to come out so that I can play with it. 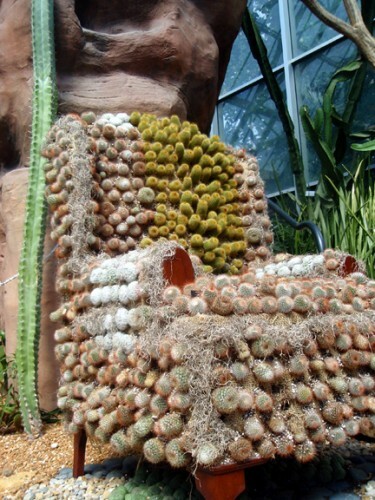 This is a chair that is built out of cactus plants. Why someone would make something like this I have no idea. But it looks cool. Though I would not want to try it out. Finally got off my lazy backside and wrote my first article in 3 years today morning. 🙂 The last article I wrote was back in 2006. I have sent it to the Linux Gazette and it has been accepted for publication. I think it might be published either next month or the month after. Once its published I will post a link here. Yay, I am so proud of myself. Now off to write more articles. As I mentioned before I recently saw the Angels and Demons movie and when I watched it I didn’t remember a lot of the book so I wanted to read it again to a)see how the book was different b) the plot was interesting. Yesterday I finished reading the book and I am happy that I didn’t remember the plot/ exact details while watching the movie as some of the changes they made in the movie would have irritated me while watching it. A lot of things were changed in the movie to make it simpler and more straight forward. I think the movie was toned down a lot in comparison to the book to reduce the opposition from the Church and religious community. But the good part is that they managed to do it well enough that the movie came out well and was not a complete disaster like the Da Vinci Code. In all most changes were minor but a few stood out. 1. In the movie there is very little involvement of the CERN, and none at all of its director. In the book he is the one who tapes the branding of the chamberlain while in the movie its recorded by the security camera’s installed in the office. 2. The movie completely glosses over the whole debate of proving genesis using the anti-matter which is covered in great detail in the book. 3. In the movie the last preferiti survives and is confirmed (?) as the pope but in the book he also dies. 4. 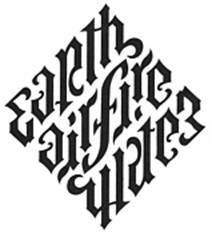 In the book the final brand used is the Illuminati Diamond (see image below) which is an ambigram of the four elements arranged in the shape of a diamond while in the movie they use the Vatican’s symbol as the final brand. This point irritated me the most and what point was served by changing this is something beyond me. If one of the readers can explain this to me I will appreciate it. While writing this post I found out that some parts of the movie were censored in India (Source: The Hindu) so now I want to watch the uncensored version to see what was different. For that I will have to wait for the DVD to come out, which hopefully will not take that long. So why do I blog? and what do I blog about? Nowadays everyone seems to have a blog, but when I first started keeping a blog very few people did it. So I used to get this question a lot. Another popular one was: What do you blog about? 4. It lets me talk about the stuff I do and places I visit. Basically this blog is an expansion of the stuff I post on my website, in more detail and with a lot more regular updates. When I started out, I used to post atleast once a day. Then it went down to a couple of times a week, then to a few times a month. Now the frequency varies with how busy I am and what all is happening in my life. What I don’t do is post about stuff that affects other people or happened to them. I also don’t post about work and my job. The reason for that is simple, what I post out here is available for everyone to read. If I complain about work or post something like ‘oh we had a hard time today because all the developers were drunk’ or ‘the code we write is so bad its a wonder anyone buys it’ or something; then anyone searching about the company or me will find it and its not good for the company or my image. So instead of trying to figure out what to post and what not to post I avoid posting about work and work related issues. That doesn’t mean that any talk about work is banned, just that 99.999% of it is about non-work related stuff. In the case mentioned above, did the Twitter post cause the house to be burglarized? I don’t know. It could have. All it did was tell people that they weren’t home. The same information is available from their away message on email, message on voice mail greetings, from their secretary and tons of other places. It doesn’t make Twitter bad. You just have to use common-sense to decide what to post and what not to. Same thing with any media: blogs, websites etc etc. System back to normal. So is life. Spent most of yesterday afternoon customizing my system so that it works just the way it used to. The upgrade itself didn’t take long, it was getting the shortcuts/look and feel of the system back to the way I like it that took time. Plus I was reading an interesting book, so it took longer. Watched ‘Garfield: Pet Force’ yesterday. It is a decent time pass movie, It was animated so no horrible acting to deal with. Saw part of Terminator 4. Stopped in the middle as it was a bad print. I want to watch it in the theater but am still waiting for it to come out in the Theaters over here. Watched Angels and Demons last week. Had completely forgotten the book so it was a fun watch and I liked it. I am planning on re-reading the book to see what was different in the movie. We went for the 10:30 pm show and there were hardly any people in the theater. Unstable -> As the name says this repository contains programs that might have issues integrating with other programs in Debian. Doesn’t mean that the programs themselves are unstable, just means that they might not play well with others. Usually this contains the latest versions of software. Anyways, usually I always run the Unstable branch but this time since v5 had just been released I stuck with the Stable branch to try it out. I really liked it. and went off to sleep. Today all the items were downloaded and I logged in to KDE4 (the latest version) and I am not pleased. It looks like Vista. All the menu’s are changed. The control panel looks and works like the Windows Control Panel. If I wanted a Vista experience I would have installed Vista on my system. In the old KDE I could update the wallpaper for any of my 4 desktops from one location. I this one I don’t seem to be able to do so. Plus I can’t get the system to start showing the ‘Quick Launch’ bar. When I add that widget I get a 2mm – 5 mm wide blank area added to my taskbar. To top it all Plasma is using 80%-90% of my CPU even when I am not going anything other than typing this post. I thought I should get a screenshot of my CPU usage and loaded up GIMP, but in KDE4 this loads up two separate windows, one with the toolbox and one with the menu items. What the hell? What was wrong with the old way where the menu items were listed on top of the toolbox. Now that place is empty and the menu’s are in another window. So my verdict? I am switching back to Debian Stable. Unfortunately it will mean reinstalling the OS ’cause there is no way to downgrade from Testing to stable. thankfully all my data is kept separately so I just have to format one partition. But still its a pain. I will keep with this version until Debian forces me to upgrade to KDE4. After that… lets see, I might try other desktop managers or hopefully by then KDE4 will have matured and cleared up these issues.